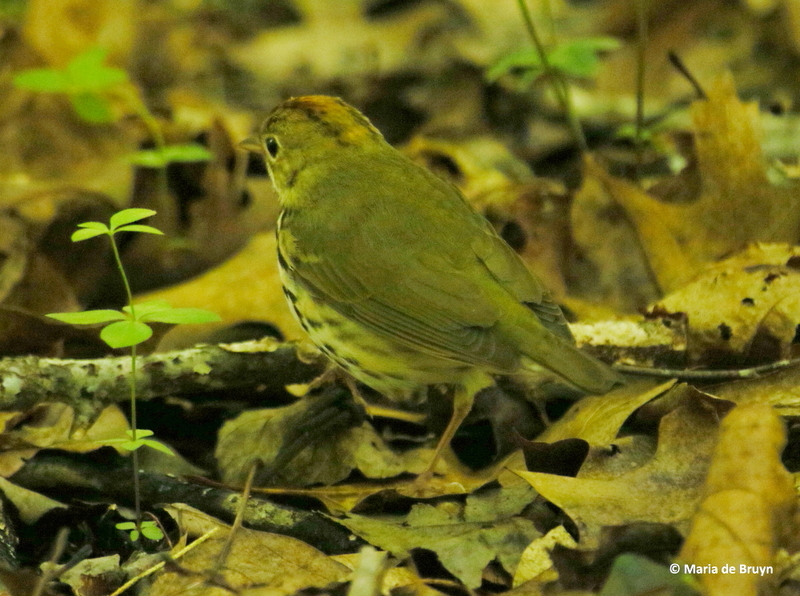 Recently, I’ve had the good fortune to observe a small bird at close quarters that I had only seen in a couple glimpses in the past, the ovenbird (Seiurus aurocapilla). 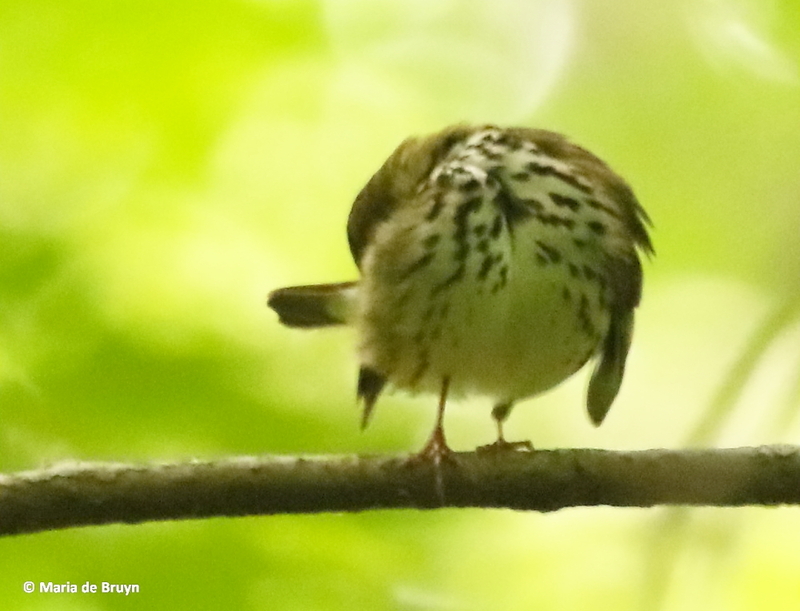 Like the ruby-crowned and golden-crowned kinglets, this little avian also has a stripe atop its head. 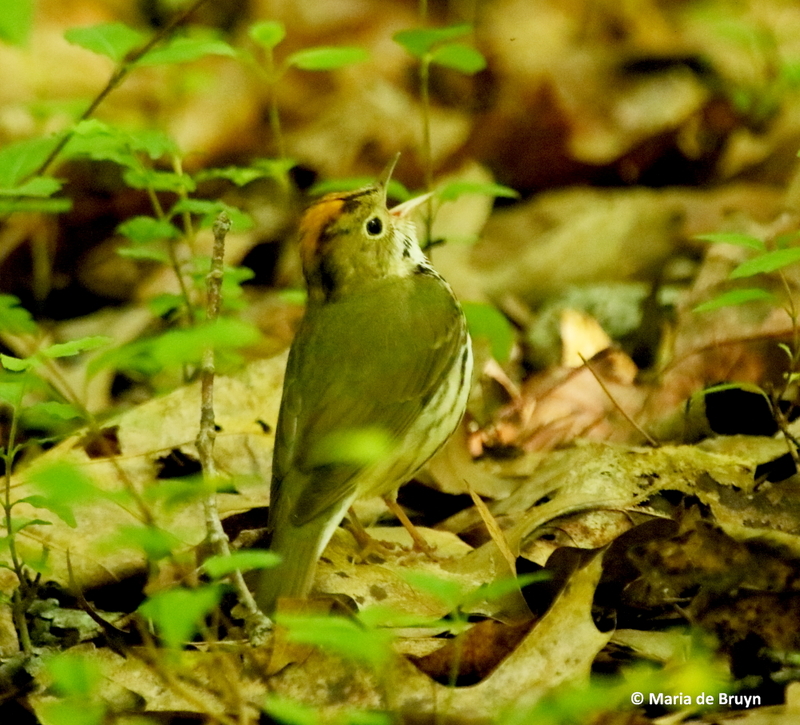 Like the golden-crowned kinglet, the stripe is always visible and orange in color, blending in nicely with its other muted brownish and cream colors. 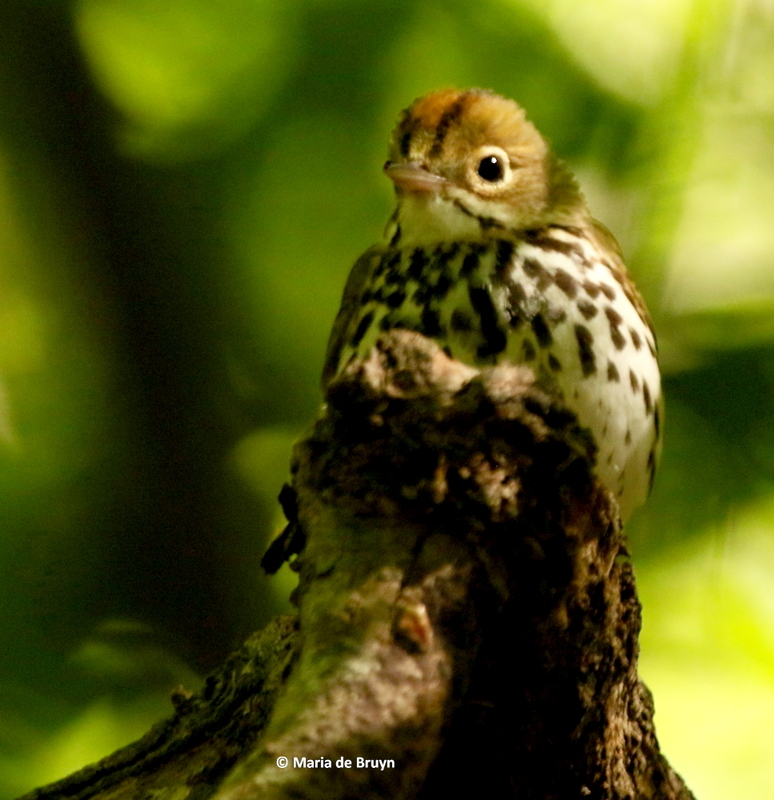 The ovenbird gets its name from the shape of its nest, which is built on the ground in a shape reminiscent of an outdoor or Hopi oven. It is domed and has a side entrance and can be difficult to see. 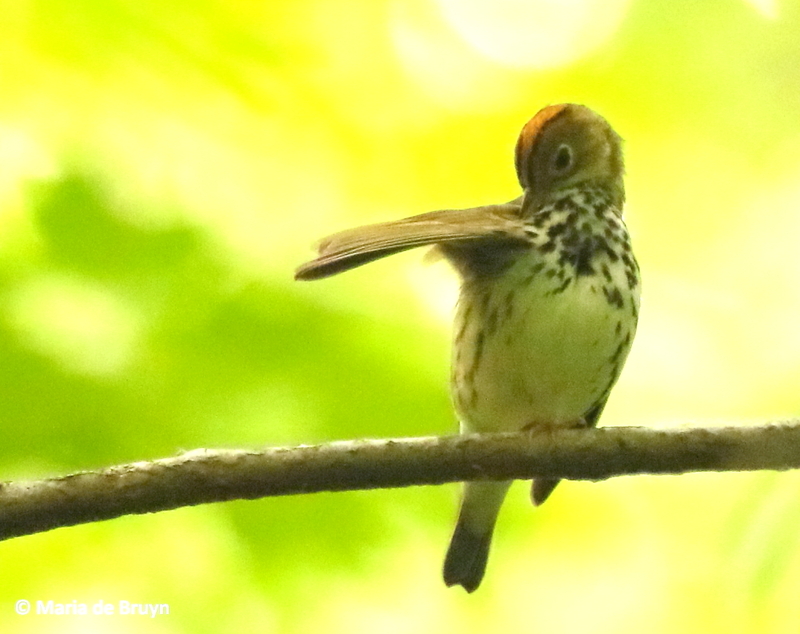 The ovenbirds spend the winters in the Caribbean region and Central America and then come North for the summer breeding season. 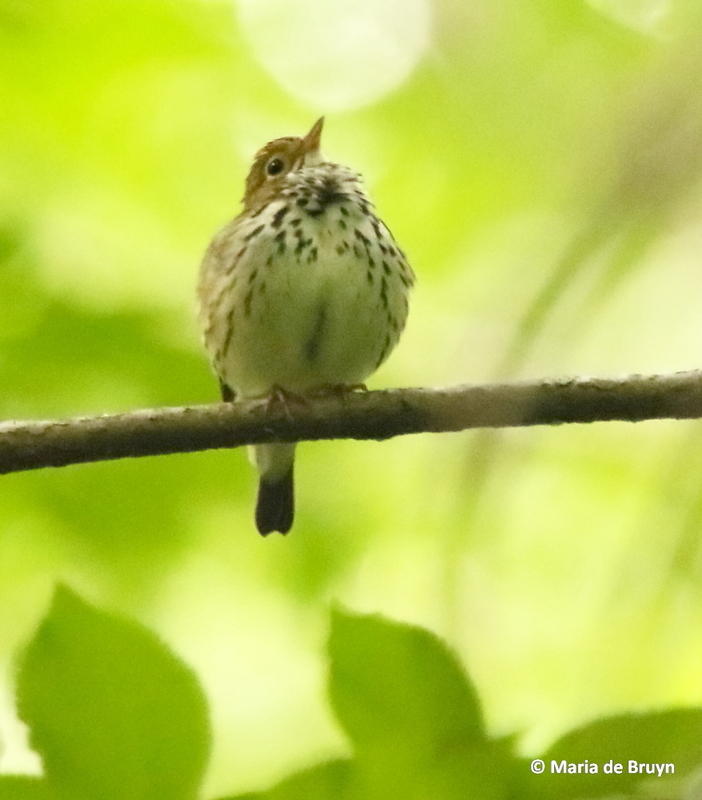 My sightings of the singing male have been at our local nature reserve, Mason Farm Biological Reserve, where I volunteer as an invasive plant eradicator and sometime planter of native flowers. The male sings a three- to-five note call in the spring as part of his courting behavior and the call varies among individuals. 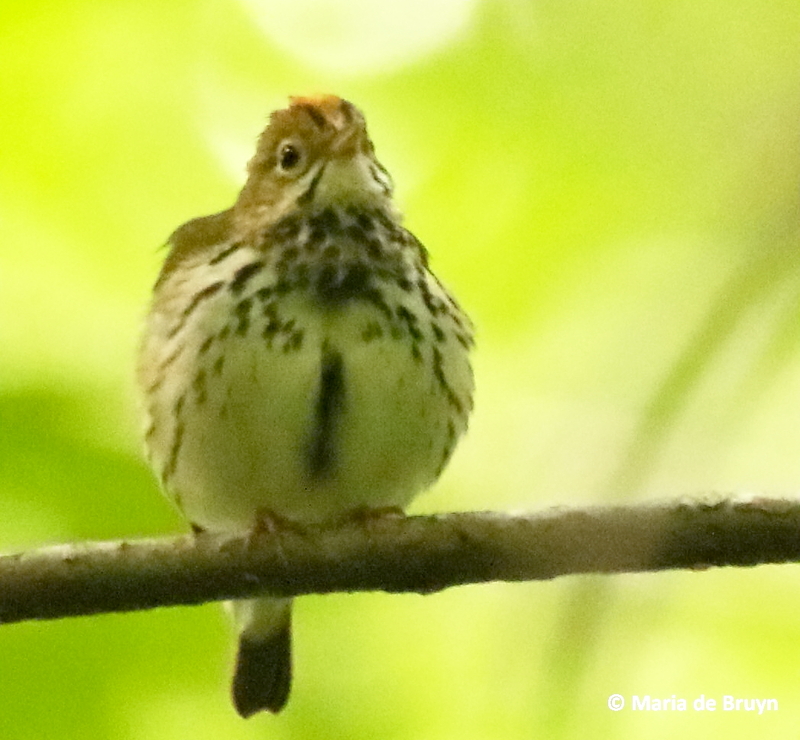 When males are in neighboring territories, they will sing together in duets and it can be difficult to know how many birds are singing. 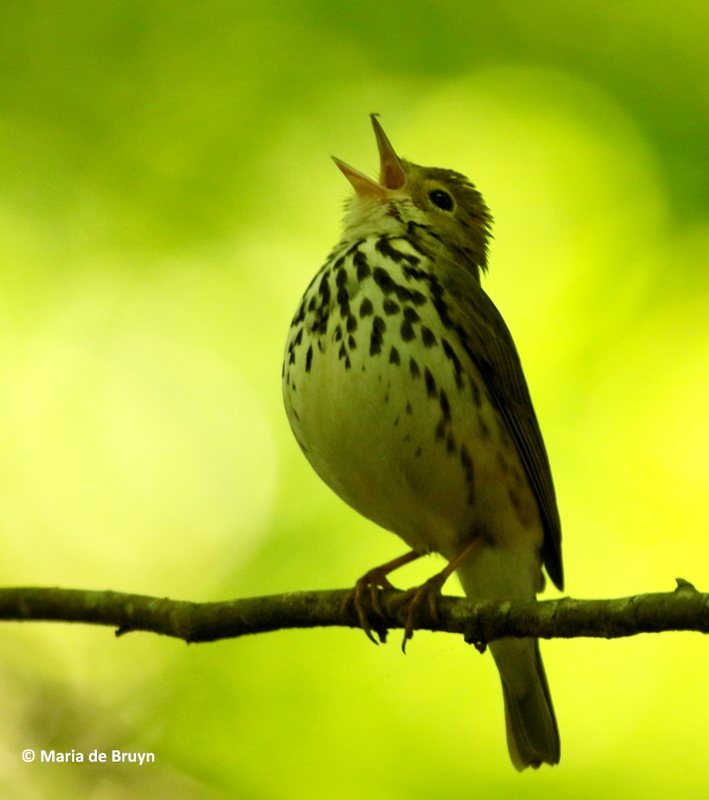 The sound is so loud that you expect to see a much larger bird and his song inspired poet Robert Frost to dedicate a poem to him. 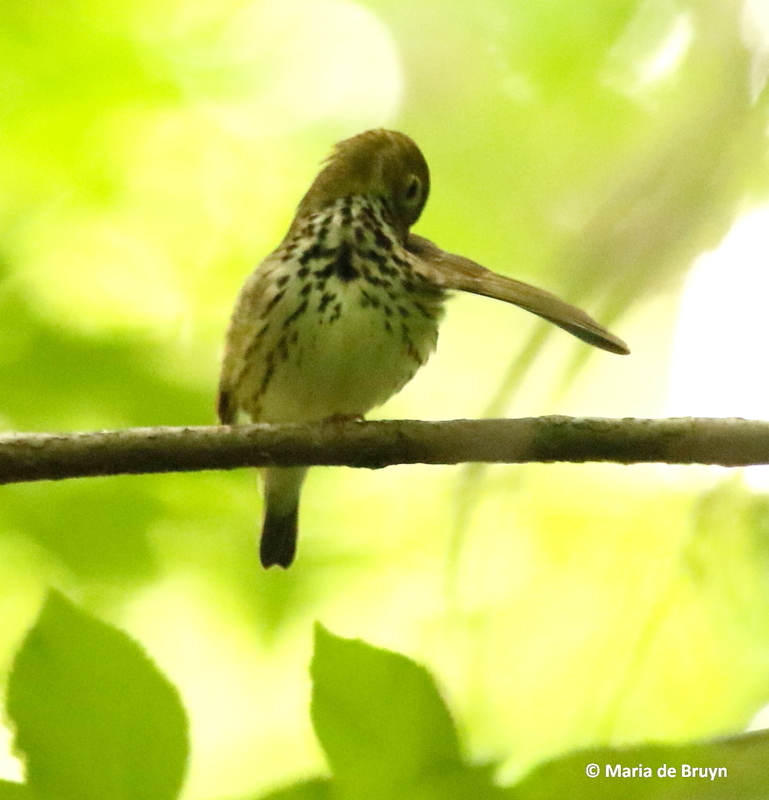 If he is sitting on a branch, you can eventually find him but it can be a challenge since they prefer to reside in forests with heavy canopy cover so that it is fairly dark. Once you see him, you may be able to watch for a while as they don’t seem to be very wary of people. 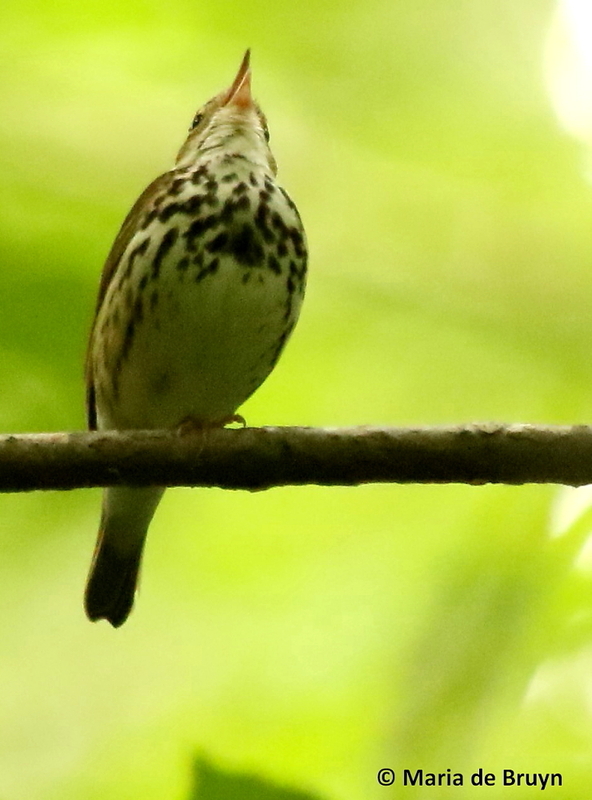 This individual let me observe as he groomed on a low tree branch, pausing now and again to let out a few notes. 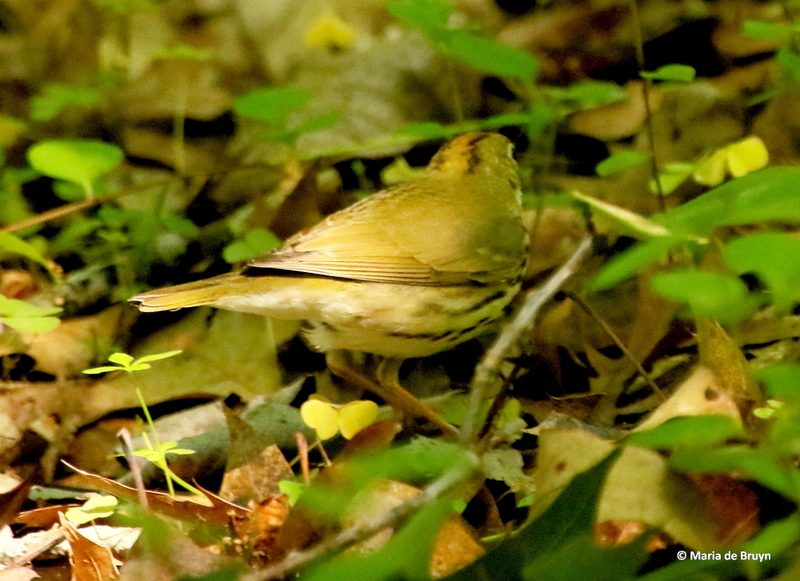 These birds prefer areas with heavy leaf litter for their homes – the leaves provide cover for their ground nests and they blend in really, really well as they scurry about foraging in the leaves for insects, worms and snails to eat. Both the females and males participate in feeding the fledglings until they can fly at about 30 days. When they emerge into a patch with a bit of sunlight filtering down through the leaves overhead, you have a bit better chance to see them. Otherwise, you may end up staring at ground cover until you catch a bit of movement and can zero in on the motion to see them. 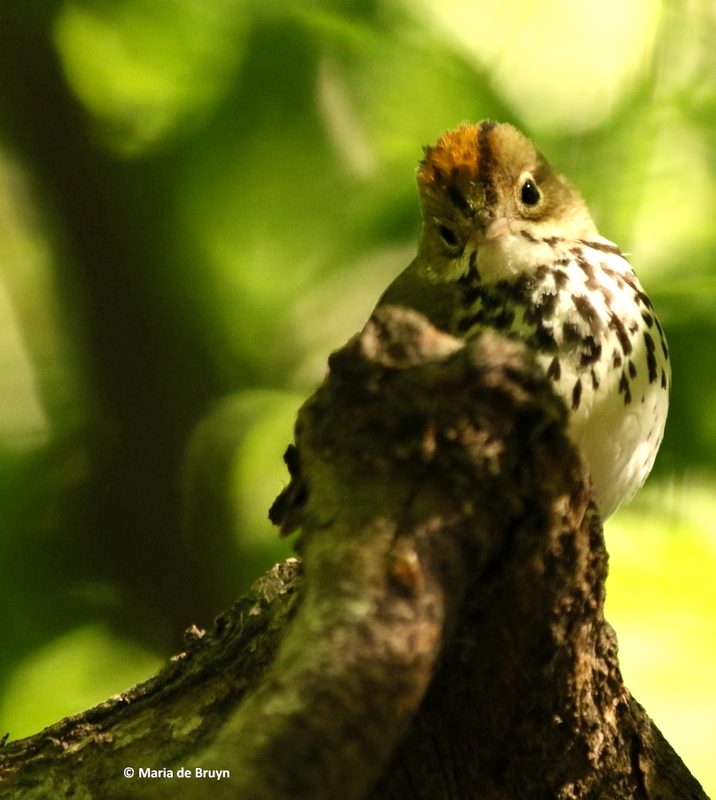 Photographing the bird is a challenge since they spend their time in areas with so little direct light. My first photos were a bit dark, but then I increased the ISO on my camera considerably (a tip from fellow photographer, Mary – thanks!) and the photos were a bit better. 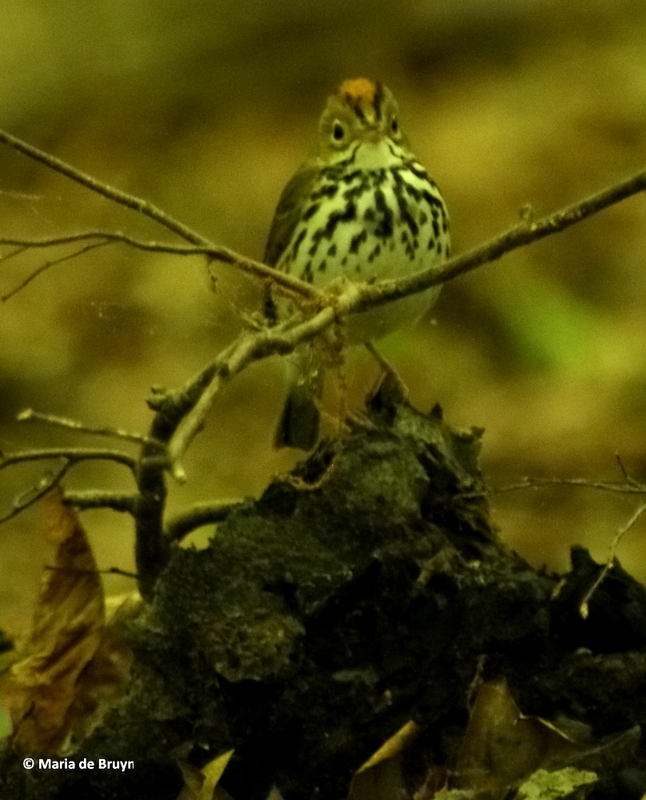 Still, the somewhat darker photos reflect the environment in which you discover these little troubadour warblers. Now that I know where to look for them, I hope to see them more often in years to come. 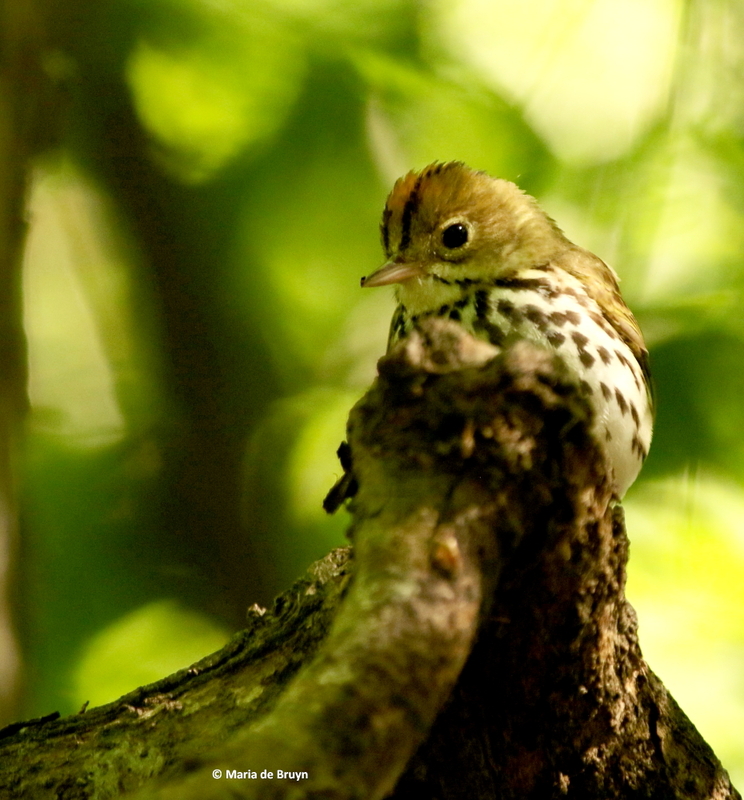 This entry was posted in Animal behavior, Birds, migration, nature, Nature reserve, nesting, Springtime, wildlife and tagged avian, behavior, bird, environment, feeding, forest canopy, head stripe, male, Mason Farm Biological Reserve, migration, nature, North Carolina, ovenbird, poem about birds, scientific identification, scientific name, Seiurus aurocapilla, song, warbler, wildlife by Maria dB. Bookmark the permalink. Thanks, Mary. 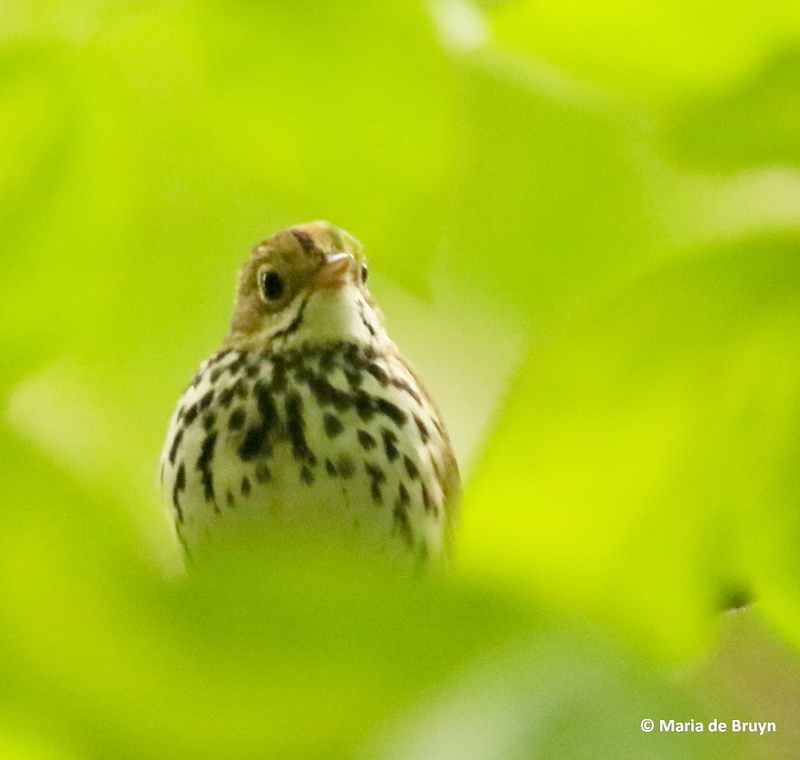 I didn’t expect being able to see this bird three times this spring – nature provides unexpected pleasures! Good evening! As long as you put my photo credit with the photo and a link to the blog, you have my permission. Please let me know the link to your video – I look forward to hearing/seeing it!